The whole world is gradually shifting to ‘Cloud’. This new-age technology comes with a bundle of advantages. If you are an entrepreneur or a decision-maker in a business organisation, it is time now that you should learn about the benefits that cloud IT solutions bring in. May be some of your competitors have already started using Cloud services available in SAP, Oracle, Sales Force etc. and that is not due to any hype. We are sure you would not like the idea of lagging behind. 1. Cloud solutions help you to elevate to the contemporary, highly cost-effective Operational Expense model from the age-old Capital Expense model of business operation. 2. If you can sync these solutions with the BYOD (Bring Your Own Device) model, you can further reduce the recurring operations costs. 3. You shall be able to connect to the process as and when required and from anywhere. Most of the times the chief decision makers of the company need to travel a lot and during those times tracking the operation real-time becomes possible with cloud IT solutions. 4. Apart from keeping the business process under constant surveillance you will also be able to check the latest updates at any point of time so that modifying or formulating strategies become easy. 5. Since the work process becomes smarter that creates an impact on the human resource efficiency of the organisation. It creates an invisible push to make the employees hone their skills further and contribute better to the company process. 6. 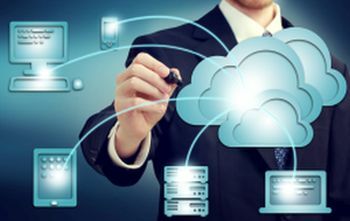 Cloud solutions provide better security to company data and content since there is no fear of losing valuable information due to system crash or hardware malfunctioning. 7. These solutions enable multiple employees to work on a single datasheet. This reduces operational delay and minimizes man-hour costs considerably. 8. Cloud solutions help to improve customer service, make customer relationship management more efficient and contribute in creating a loyal customer base. There are many other advantages and the solutions can be customized. If you seek more information on this, please feel free to contact us anytime and also learn how we can help you implement cloud IT solutions in your organisation.